1916, 2-storey and basement rectangular-plan hall, incorporating earlier fabric and later alterations. Tenemental core of main building, 1849; reduced in height and truncated; stugged squared and snecked sandstone in random courses; long and short quoins; droved ashlar margins; infilled regularly-spaced openings. Scots Baronial detailing to SE corner, 1916; random snecked rubble; long and short irregular-shaped quoins; rendered concrete lintels; corbelling; irregular fenestration; infilled openings. Slender red brick (common bond) 2-storey and basement extension to W elevation, 1862; yellow brick margins and quoins; regular fenestration. Small harled single storey extension to S elevation, 1960s; raised bull-faced long and short quoins; tripartite window with rendered concrete margins. Landscaped garden in courtyard, Turnbull Jeffrey Partnership, 1999. S (PRINCIPAL) ELEVATION: steps up to central chamfered entrance doorway with raised polished margins; tripartite window to right; brick relieving arches to both; central tripartite window above. Basement level with doorway and bipartite window to left. Slightly advanced gable at outer right; curved facade below; projecting corbelled section above. N (REAR) ELEVATION: 3-storey 4-bay plain gable end; many bricked-up window openings. W ELEVATION: 3-storey; central advanced 2-bay brick section; cills appear raised; timber basement door; plain 3-bay section to left; harled single storey section to outer right. E ELEVATION: (partially obscured by ivy) slightly advanced corbelled gable to outer left; entrance door at basment level; stair windows above; wallhead gable stack. Range to right; windows at ground; blocked openings to outer left at all 3 floors have timber or stone lintels; central shouldered wallhead stack. Late 20th century timber glazing, predominantly 12-pane sash and case; also 6-pane timber casements, in appropriate style. Glazed doors with timber astragals. Grey slate pitched roofs; skylights; air vent. Coped stacks, that to W gable is 1994 replacement; clay cans. Cast-iron rainwater goods. INTERIOR: entrance hall; timber glazed doors to large central hall; heavy timbered open kingpost truss roof; timber panelling to dado height; timber panelled gallery at S end; modern mezzanine floor along W wall; stairs to basement. Lower hall with sprung floor and timber panelled dado. 3-apartment caretaker's flat; 3 cast-iron chimneypieces. Fresh air vents with hopper-type doors regularly spaced on external walls throughout. LANDSCAPED GARDEN: central circular lawn; pebble border; drystane wall with flat coping; adjacent circular seating area with metal benches; surrounding shrub planting, trees and paving; painted steel gates at each close entrance. The site of Sandeman House, bounded by Trunk's Close and Baron Maule's Close, is of great historical significance being in the heart of the Old Town. 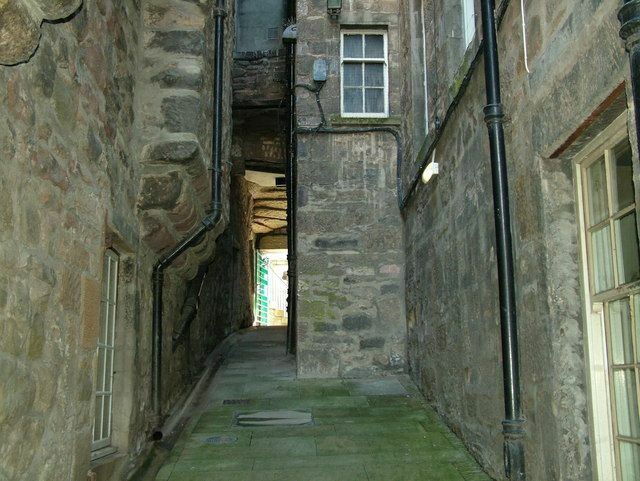 Hope's Close, presently blocked up, lies between these two closes and gave further access from the High Street to Hope's Court, overlooked by the 15th and 16th century rear ranges of Moubray House and John Knox House. The tenements, known as Ashley Buildings, which stood on the site were built in 1849 as model working-class housing by Lord Ashley (later the Earl of Shaftesbury), the reforming politician who had similar housing ventures in London. The buildings had innovative plumbing, waste disposal systems and air vents but little else of any merit and were partially demolished in 1869 when Jeffrey Street was constructed as part of the City Improvement Scheme. Today the north elevation provides evidence of the taller tenemental form of the building which appears to have been at least 4 storeys in height. The east elevation, formerly a party wall of Ashley Buildings, shows blocked openings of fireplaces and wallpresses with timber and stone lintels. A brick tenement was constructed circa 1862 in the space between the rear range of Moubray House and Ashley Buildings and the projection to the W is a remnant of this. Sandeman Halls were constructed in 1916, when the area (and the brick tenement) was finally cleared, using material left from Ashley Buildings. They were designated for Moray Knox Free Church congregational use when the Moray and John Knox Free Churches merged and commemorate the Rev Dr John Sandeman (d.1914) of St Andrew's Free Church at Drumsheugh who conducted mission work in the area. The building was bought by Turnbull Jeffrey Partnership, landscape architects, in 1987 and carefully restored in 1994. 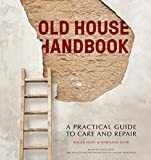 Before work began to landscape the courtyard, an archaeological survey was carried out in 1998 uncovering evidence of a massive tenement about 2m below ground, a backland wall, a stone drain and other mixed foundation material. The focal point of the garden is the circular lawn and drystane wall constructed from Caithness stone. The metal sculpture of a cockerel is by Phil Johnson, 1993. The entire scheme was noted for its sensitive and contemporary approach recognising the character of the Old Town, together with a high level of craftsmanship, on its completion in 1999.